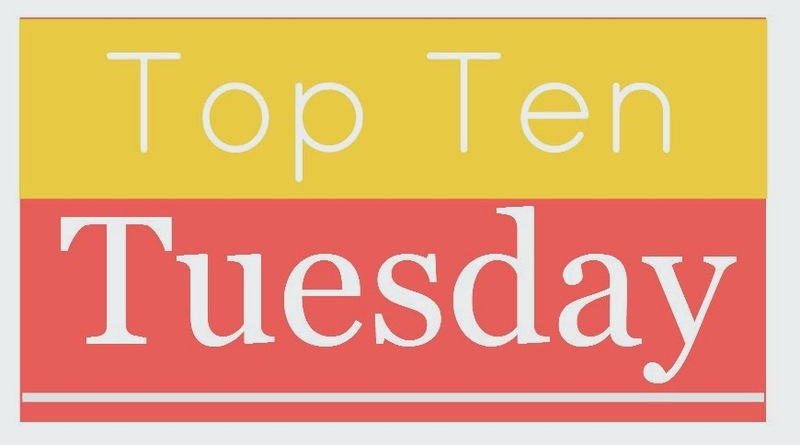 I've been so busy trying to catch up on reviews of books I read LAST year plus keeping up with those I'm scheduled to review THIS year that I haven't done Top Ten Tuesday in awhile. I miss it! This week's topic looks fun and easy, so I'm joining in. You should, too. All you have to do is click on over to The Broke and the Bookish, follow the directions, and you're in. Easy cheesy. 1. Silence by Deborah Lytton—I'm hoping to get to this one really, really soon as I was supposed to have reviewed it a few days back. It's about a girl with a golden voice whose greatest dream is to sing on Broadway. Then, a tragic accident renders her deaf. Sounds compelling, no? 2. Everything I Never Told You by Celeste Ng—After a long wait, I've finally got this family drama/murder mystery out from the library. I'm excited to see if it lives up to all the hype. 3. Kiss Kill Vanish by Jessica Martinez—I'm intrigued by this YA novel about a girl trying to shed her old identity in a new country, only to have someone from her past show up to complicate things. 4. Descent by Tim Johnston—I'm on the waiting list at the library for this one, which looks fantastic. It's about a family vacationing in the Rocky Mountains when one of their children goes missing. 5. The Husband's Secret by Liane Moriarty—I loved Big Little Lies and I've heard that Moriarty's other books are even better. Can't wait to read this one. 6. On Such a Full Sea by Chang-rae Lee—This dystopian sounds different, therefore I must check it out! 7. The Hollow Ground by Natalie S. Harnett—I'm actually in the middle of this family drama/murder mystery set in Pennsylvania's coal mining country. It's about a girl who finds a body in an abandoned monkey hole, a find that uncovers family secrets long buried. So far, it's excellent. 8. Saint Anything by Sarah Dessen—I've only read a couple of Dessen's books. This one looks like a bit of a departure for her, so I'm interested to see what it's all about. 9. Dead Wake by Erik Larson—I don't read a lot of non-fiction (a problem I need to remedy), but this book about the Lusitania sounds fascinating. 10. Chestnut Street by Maeve Binchy—Several of my favorite authors, including Binchy, have died in the last few years, which makes me super sad. I love Binchy's novels about everyday families in Ireland. At the time of her death, she was working on a collection of stories about people living on an ordinary Dublin street. Although I'm not big on short stories, I'll read anything by Binchy. So, there you have it. Kind of an eclectic list, but all ten are books I'm excited about. Hopefully, I'll get to them this Spring. How about you? What's on your list? I really really really need to read The Husband's Secret. Have heard only good things about it. Same. I bought it awhile back, now I just need to read it! I've heard good things about WHEN BOOKS WENT TO WAR as well. It's on my TBR mountain chain! Can't go wrong with books about books. Looks like a fun list. I love that you use your library. I'm really bad at that. I always just buy books. I need to get over that. I've always loved the library, but I'm using it more these days because I promised the hubs if he let me ship our pup off to boarding school (to the tune of $1300), I wouldn't buy any books this year :) It's been hard, but the dog training was worth it! Oh, and I've been meaning to read CHESTNUT STREET as well. Maeve Binchy - I've loved several of her books. Miss her. I haven't started EVERYTHING ... It looks like something I'll like, but it's hard to tell sometimes. I've only heard of the Sarah Dessen book which looks rather dark compared to her other novels. Happy reading! I've never read all of these although I'm definitely checking out many of these starting with Kiss Kill Vanish. I got that Celeste Ng novel on audio but I haven't been able to make time for it yet. I've heard fantastic things about it though! I've heard fantastic things about Liane Moriarty's books too, I need to get my hands on some of those! :) Great list! There are a few I need to look into more. Thanks for stopping by! you really have been posting like crazy this year! I liked Husband's Secret, but I thought Big Little Lies was a bit better. What Alice Forgot is by far my favorite of hers. I also can't wait for Dead Wake. The new Penderwicks book is also very high on my list.